Alright, I lied. I wrote that this series would stick to Japanese creatures of the city-destroying variety, but here I am about to discuss a man-sized monster. But hey, it’s my blog and I can do what I want. Matango has had a tarnished reputation. 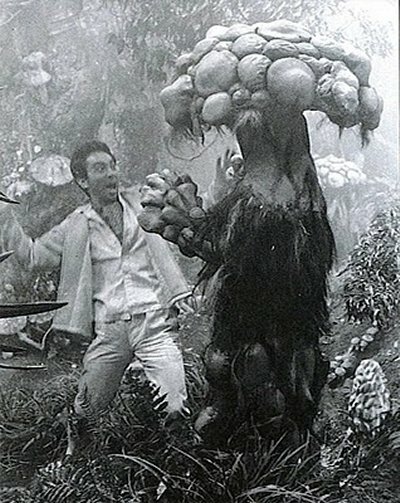 For U.S. television distribution it was saddled with the silly title Attack of the Mushroom People. And its inclusion in Michael Medved’s book The Golden Turkey Awards probably didn’t help. Matango is actually quite an effective, atmospheric horror film. You can read more about it in the review I wrote a couple of years ago, but in short, it’s the story of seven stranded castaways* on a deserted island covered in oversized, highly-addictive mushrooms. One by one, the starving shipwreck survivors succumb to their desires and find themselves metamorphosing into (admittedly goofy) fungi. There’s no last-minute rescue, no hastily-derived antidote. Just fog, and rain, and an ever-expanding carpet of colorful toadstools. *I know what you’re thinking, but it was produced a year prior to Gilligan’s Island. That said, it’s odd that its characters include a skipper, a first mate, a millionaire, a professor, a sexpot celebrity and an ingenue. The only one missing is Mrs. Howell.